At the opening Christian Holenstein impressed the public with an open air alphorn concert, performed with a Swiss traditional instrument. The musical act was followed by the gala concert: the beloved academy duo, Alexandru Gavrilovici (violin) with Viniciu Moroianu (pian) and the very known cellist Katharina Gohl performed beautiful music written by well known Swiss composer Roland Moser, Romanian composer Constantin Silvestri, and also the great Ludwig van Beethoven. The concert ended with a special encore of pianist Moroianu that offered him compliments and big applaudes! 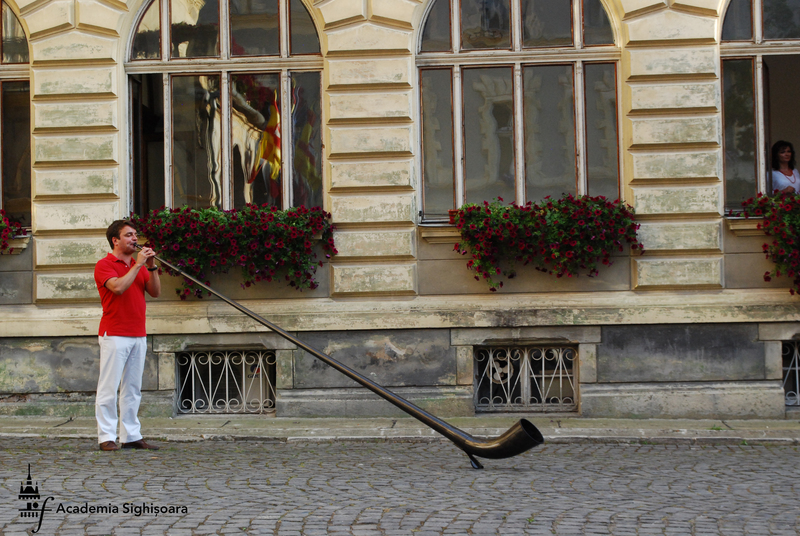 Academia Sighisoara traditional starts on the 1st of August, Switzerland's National Day. This years jubilee edition was honoured - beside many guests and friends -, by the presence of Jean-Hubert Lebet, The Ambassador of the Swiss Confederation in Romania.